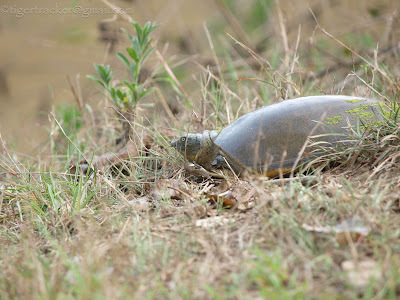 Now, who said turtles are slow. I, for once, disagree. Bandipur this April had a surprise in store for me. 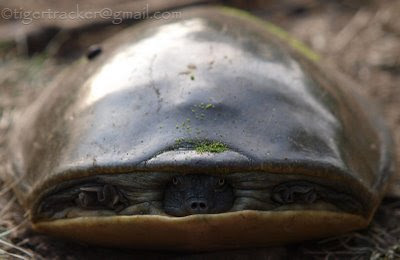 The Flap-shell turtle. 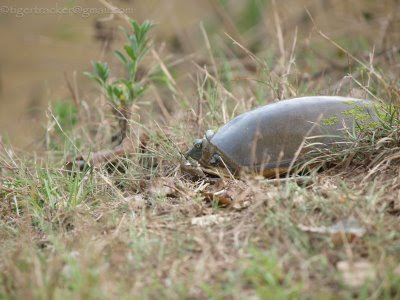 I've seen terrapins & turtles basking in the warm sun many times in BR Hills, Bandipur and elsewhere, but never so close up. Close enough to experience the discomfiture caused by the defensive spray of it's obnoxious secretion. Safari on that day began in a pall of gloom. The overcast sky was not a good omen. Large mammals would wait for the sun to rise high in the sky. That was till we saw a shiny object lying beside the jeep track. Kiran, our driver, braked and jumped out. 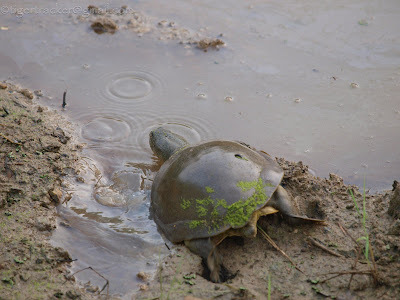 "Flap shell turtle", he announced. This was something different. Better than sighting an elephant or gaur. We all jumped off to examine this strange creature. Ensconed under it's protective shell it was unafraid of us. It just withdrew it's head and appendages deeper inside and lay still. When Mithun, our naturalist tried picking it up it sprayed him in annoyance. That did not prevent everyone from having a feel. After we had had a close look we decided to leave it be, then as an afterthought we thought of putting it back in the water before some vehicle ran over it. 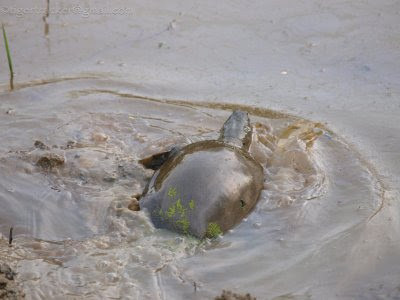 So we left it on the edge of the water hole. The events after that unfolded very quickly. 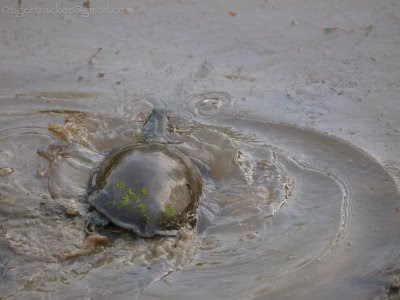 It took a little over a minute to gather courage to peep out of its shell. Bit by bit, the nose, the eyes, and then the whole head came out. Once it got the bearings the next move took me by surprise. 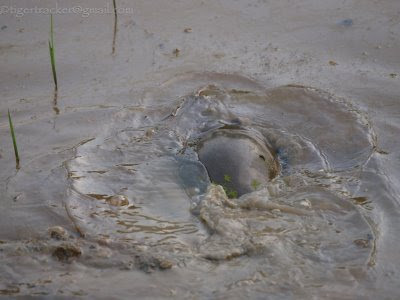 Suddenly the stumpy legs shot out, pressed back against the earth and propelled the disc toward the water. Before I could align the camera, (the pictures speak for themselves), it was off like a missile. The next three meters were done in three seconds, as my camera's time stamp would tell me. 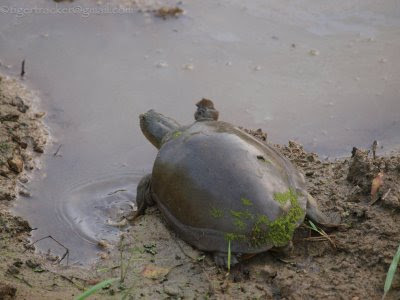 Pushing hard, it fell off the edge of the pond, righted itself and scrambled off again. 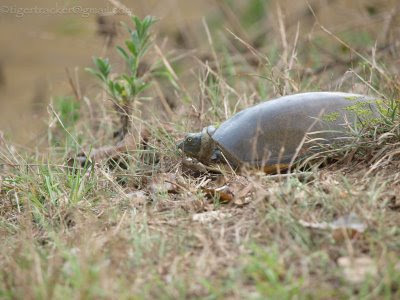 Once it hit the water's edge it took under a second to disappear; head, shell, appendages and all. If it can travel at a meter every second, it would cover some four kilometers in an hour. Not bad for a turtle. 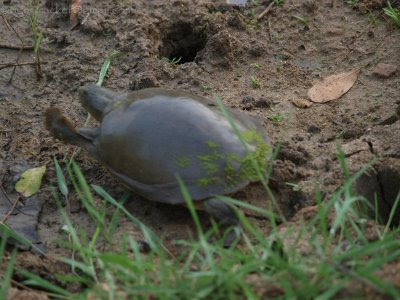 Perhaps, the Formula 1 turtle of Bandipur! !